Spring is near, crusty snow is crumbling, the melt is underway! It's time you come out of your winter shell and visit the Aquarium. And since we're talking about shells there's no better time to (re)introduce some very cool animals with shells. Any Aquarium fan can probably guess the largest of our shelled animals. It's Myrtle. The green sea turtle. Of course. 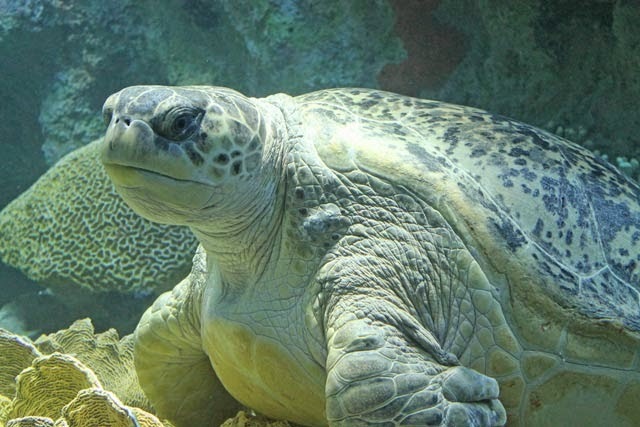 She tips the scales at a whopping 550-pounds and her shell measures about four feet long from her neck to her tail. She's just one of three sea turtles in the Giant Ocean Tank. Many people don't know that Myrtle loves to get back scratches. True! Turtle shells are comprised of bone covered by a keratin layer (a modified type of skin). There are many nerve endings in turtle shells, so in fact a back scratch probably feels pretty good. Obviously Myrtle steals the show. But don't forget the little guys! There are a lot of other smaller turtles around the Aquarium. 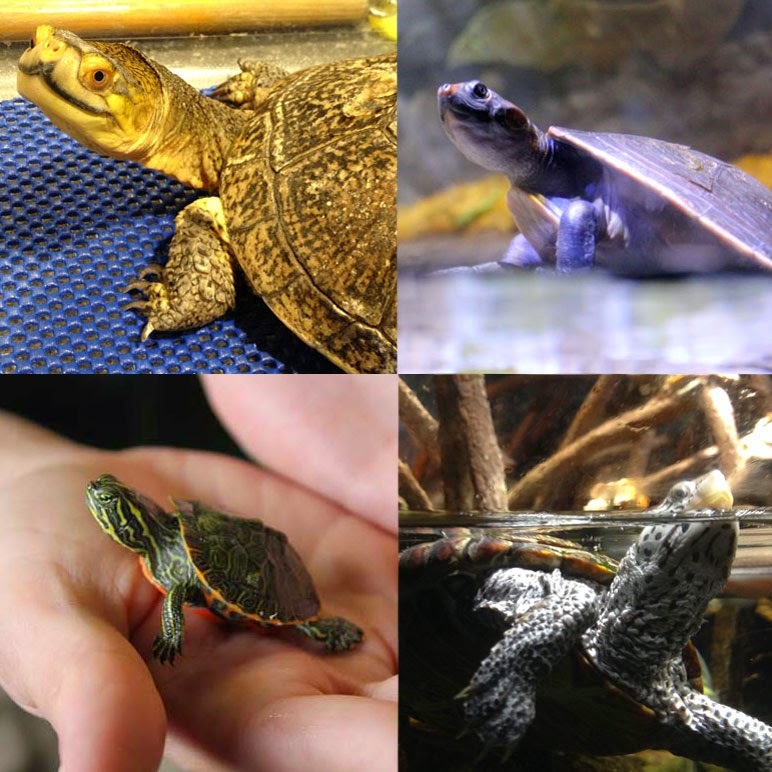 Several species are exhibited during our Live Animal Presentations in the Blue Planet Action Center—including Skip the Blandings turtle (upper left above), a common snapping turtle, box turtles and adult red-bellied cooters (you can see baby red-bellied cooters lower left above). In the Amazon Rainforest exhibits you'll find the red-headed river turtle and the yellow-spotted river turtle. And in the brackish mangrove exhibit in the Thinking Gallery you'll find diamondback terrapins. Funny story: There's a sign on the mangrove exhibit reading "Watch for escaping turtles!" that you can see during our Behind-the-Scenes Tours (just a $20 add-on to your Aquarium admission). They're pretty adept climbers and they can easily crawl out of the exhibit if the lid is removed. 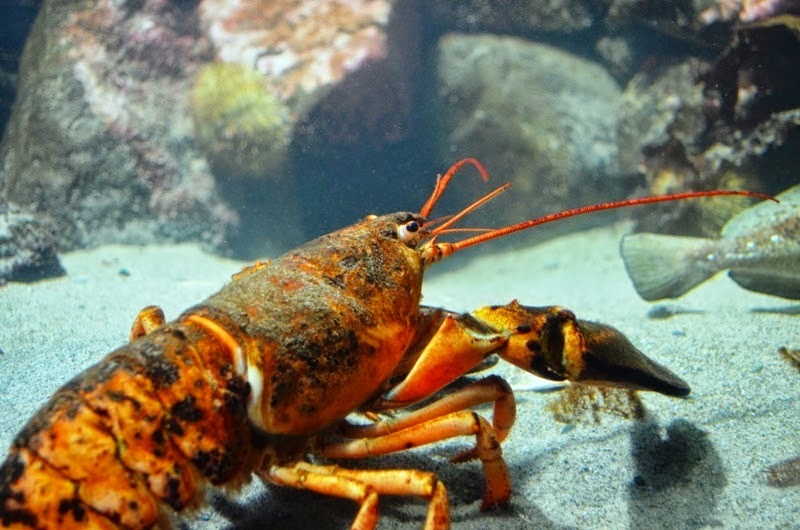 Lobster shells come in many patterns and colors including calico, blue, two-tone and orange—and those are just the American lobsters (Homarus americanus). Watch Aquarium scientist Michael Tlusty (who studies lobster shell disease) explain how lobsters shells get these nifty colors. Then come visit to see lobsters in all corners of the building. Baby lobsters in the Blue Planet Action Center, spiny lobsters in the Blue Hole exhibit and dueling lobsters in the Northern Waters gallery (who prevails—orange or blue?!). 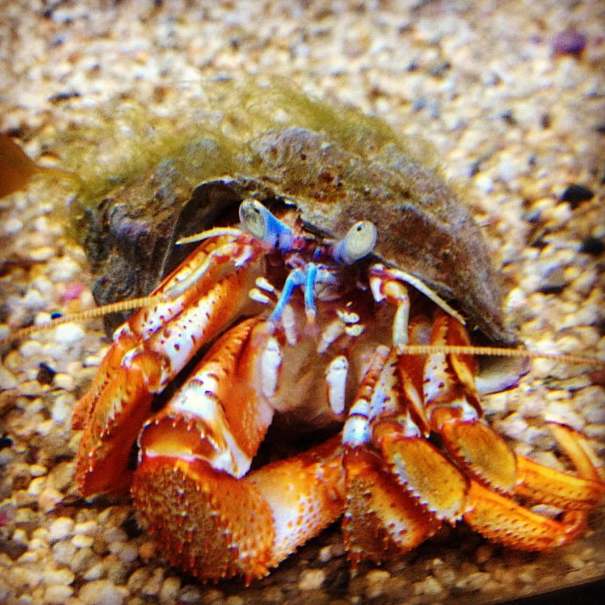 Hermit crabs are another crustacean you'll find in exhibits throughout the Aquarium—from the Living Corals exhibit to the Edge of the Sea touch tank to the goosefish exhibit to the Garden Eel exhibit. Just look closely at the industrious creature navigating the bottom of the exhibits with its home on its back. Speaking of, Aquarium researcher Randi Rotjan has studied hermit crab shell vacancy chains (think September 1 around Boston)! Will just look at all those eyes? OK, mollusks might not be the sexiest animals at the Aquarium but they are still pretty awesome. Here's why: Scallops have the best developed vision of all bivalves. Along the edge of the mantle up to 100 eyes are set in separate sockets, each with a lens, a retina and an optic nerve. It is doubtful that scallops can discern images; they are, nevertheless, extremely sensitive to the smallest change in light. 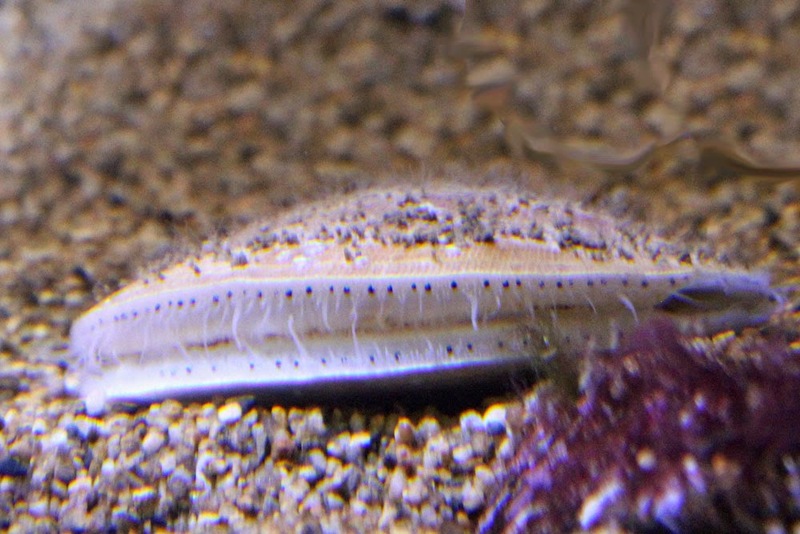 Not only can they see, scallops can crawl, climb, turn over and scuttle across the ocean floor clapping their shells. Now don't you think these shelled organisms deserve a closer look? Look for scallops underwater in the Shorebirds exhibit, the goosefish exhibit and other spots in the Northern Waters gallery. When you're ready to break out of your cold, wintry shell, come visit the Aquarium. These swell shelled creatures are just some of the fascinating animals you can discover during your next trip.